Macular degeneration is a chronic eye disease that typically affects men and women over the age of 60. In fact, it is the leading cause of severe vision loss in men and women in that age group. 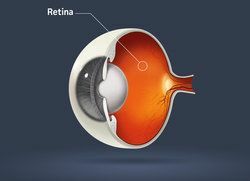 In macular degeneration, the macula (central portion of the retina) deteriorates. The deterioration of the macula results in a loss of central vision. Because of the risk of vision loss, men and women over the age of 60 should monitor their eyesight regularly for signs of macular degeneration. Beginning treatment in the early stages of the disease may help prevent severe vision loss from occurring. The eye care professionals at Monterey County Eye Associates specialize in non-surgical and surgical macular degeneration treatment. Macular degeneration, also known as age-related macular degeneration, typically results from aging. Typically, as a person enters his or her 60s, the macula begins to deteriorate. There are two types of macular degeneration: dry and wet. Dry macular degeneration, by far, is the more common of the two. The cause of dry macular degeneration is unknown. Wet macular degeneration is not as common as dry macular degeneration, but poses a greater risk to a person’s vision. A small number of patients affected by dry macular degeneration will also develop wet macular degeneration. The exact cause of wet macular degeneration is also unclear. Certain lifestyle and health factors can increase a person’s risk of developing macular degeneration; these factors include obesity, smoking, high cholesterol, and high blood pressure. Macular degeneration may also be hereditary. Vitamins: When treated in its earliest stages, macular degeneration may only require an increase in vitamin intake. Vitamin C, vitamin E, zinc, copper, and beta-carotene may help to decrease the risk of vision loss in certain patients. Eating more fruit and vegetables may also help slow the progression of macular degeneration. Medication: Anti-angiogenic drugs may be used to prevent new blood vessels from developing and to stop leakage from abnormal blood vessels from occurring. Anti-angiogenic drugs have helped many patients reverse their vision loss. Laser surgery: Laser surgery may be used to destroy abnormal, unhealthy, and leaking blood vessels. Telescopic lens: In severe cases of advanced macular degeneration in which both eyes are affected, a telescopic lens may be recommended. During surgery, the telescopic lens is implanted in the eye. The telescopic lens works by magnifying the person’s field of vision and can improve close-up and distance vision. To learn more about macular degeneration, please contact the team at Monterey County Eye Associates today.